Dove Valley is a beautiful valley in the White Peak District of Derbyshire. The River Dove rises on Axe Edge Moor near Buxton and flows south for 45 miles to the River Trent at Newton Solney but only flows through the Dove Valley for eight miles from Hartington passing through Beresford Dale, Wolfscote Dale, Milldale and Dove Dale itself to Ilam. The river is famous for trout fishing and Charles Cotton’s Fishing House is situated in the woods by the river near Hartington. Much of Dove Valley has been owned by the National Trust since 1934 and was declared a National Nature Reserve in 2006. Hartington is a major tourist village, set in the Dove Valley, with a large duck pond on the green, a cheese shop and three pubs. Hartington was once a Market Town and has some wonderful buildings built around the market place and village pump such as the Old Town Hall, Hartington Hall of 17th century and is now a Youth Hostel which has a restaurant and licensed bar and the church opposite, built of coloured local sandstone and with its perpendicular style tower, is of 14th and 15th century and the Old School House dates back to 1758. The cheese shop selling a range of local cheeses is worth a visit. The former creamery often called the cheese factory was closed in 2009. The creamery in its day was a very big supplier of Stilton, Buxton Blue and its own unique Dovedale cheese. Biggin is a farming community situated in the highest parts of the white peak district. The Tissington Trail, an old railway line, runs just to the east of the village which makes Biggin a busy place with tourists in the summer months. The village has a pub, The Waterloo, with its own caravan park and next to the pub is Biggin Hall Country House Hotel. Biggin Dale is a long dry valley stretching from Biggin village to the River Dove at Peaseland Rocks. This is a very pretty dale and is also part of the Derbyshire Dales National Nature Reserve. 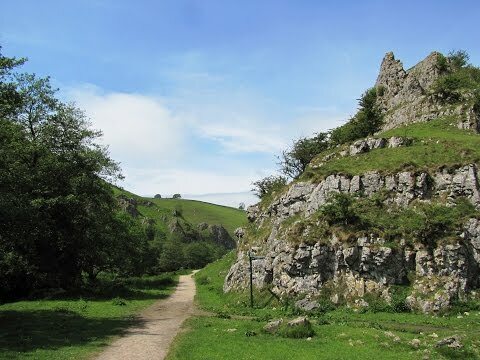 Wolfscote Dale is another very pretty dale stretching from Peaseland Rocks to Beresford Dale and Wolfscote Hill stands high above the River Dove at 388m (1272 ft) and provides fantastic views from its boulder strewn summit of the upper and lower Dovedale Valley. Beresford Dale is a beautiful, narrow and leafy miniature of Dovedale. This wooded dale with its lovely series of little weirs and wildflowers growing along the edge of the river make walking down here very peaceful and relaxing. We park in the centre of Hartington village near the duck pond and walk past the Devonshire Arms, the post office and Hartington village stores and head towards the telephone box. We turn right at the news agents at Hall Bank and follow the road round to the left past the youth hostel then carry on a little further and just before a barn take the path, Highfield Lane, on the right sign posted Biggin. We follow this lane until we come to a road. Here we turn right (If you carry on along this road there is The Waterloo pub and Biggin village) and take the first track on the right signposted Biggin Dale. We keep walking forward, keeping to the path, through the dale. We pass a pond and restoration notice and then keep heading forward until we reach another restoration pond. Here we go through a gate on the left and then turn right following the wall on our right. We pass workings on the left and keep heading forward until we come to the River Dove. Here we turn right onto a track, we are now in Wolfscote Dale, and follow the River Dove on our left with its series of little weirs. Keep your eyes open for the Grey Wagtails we saw many along this valley as you will see in our video. We see some caves in the hillside on the right so we take a look. We then go back down to the track and go through the gate next to the bridge, do not go over the bridge, we keep the river on our left and go through another gate into a field. We cross the field then go over the bridge next to some stepping stones then turn right. We are now in Beresford Dale. With the river is on our right we follow the path for a short way before crossing another bridge. We follow the path with the river now on our left through the wood until we come to open fields. We head forward through the two fields until we reach a track. Here we go through a gate over the track and through the gate opposite. We now follow the path to the road then turn right back into Hartington. This is an easy to moderate walk in two valley bottoms. Approx 6.25 miles using OS map OL24. Peak District White Area. Hartington at the head of Dove Dale in the Peak District of Derbyshire. From Buxton take the A515 towards Ashbourne. Then take the B5054 on the right to Hartington. There is a car park and parking in the centre. There are public toilets in Hartington. For refreshments there are some shops, including a cheese shop, a tea room and three pubs the Devonshire Arms, the Jug and Glass Inn and the Charles Cotton Hotel the latter two have accommodation. There is also the Hartington Hall Youth Hostel for refreshments. In Biggin there is The Waterloo pub and Biggin Hall Country House Hotel. This morning I have followed your walk route of Hartington and it was fantastic. Easy to follow and just long enough, however, some parts of the path after the pond restoration was exceptionally rocky and I did think it could be tricky for some! Had a lovely walk and the dog is now fast a sleep! This, to me, was confusing. Not any longer.